We are a charity focused on health promotion and disease prevention through our project CESAPU - Centro de Salud Pública.. Hands to Care: We need volunteers and interns to participate in the diferente community based programs. Depending of the program the volunteer will be expected to be able to take height, weight, blood pressure, respiration rates, pulse, and clinical history. The volunteer will also be trained to do the following: glucose meter tests for diabetes, auscultation exams, and potentially assist the nurses with vaccinations. Hands to Teach: We need volunteers and interns who are interested in education or who just love kids and want to give teaching a try. You will be expected to follow a set curriculum/ program using set standards of discipline and reward. This project is good for anyone interested in public health work, women's empowerment, environmental interaction, sexual and reproductive health rights, nutrition, mental health, community engagement, primary care, among others. ¡Doctors and nurses are welcome! 5 week course June 30 - August 4 ( 100+ hours of direct observation). This year-round internship is perfect for students who have already graduated, or are taking a semester off. We offer exceptional experiences for young leaders who seek a platform for social impact, giving them the opportunities to develop a deeper understanding of global poverty. This internship is designed for passionate individuals who are dedicated to global health and development, to help research, design, implement and evaluate one of our many community programs. Airport pick up (in Trujillo or Lima), Bus transportation from Lima to your location, Homestay and meals in your location, Transportation to the worksites and to the programmed activities, cultural activities, also 1 travel weekend (transportation and hostel, only available for volunteers who stay over 5 weeks), Hop t-shirt, Material for the medical lessons (Hands to Care) / transportation for orientational meetings (other programs), Material for Hands to Teach classes. Calle La Liberación Mz. E Lote 12, Centro Poblado Villa Los Angeles, Huanchaco, Peru. 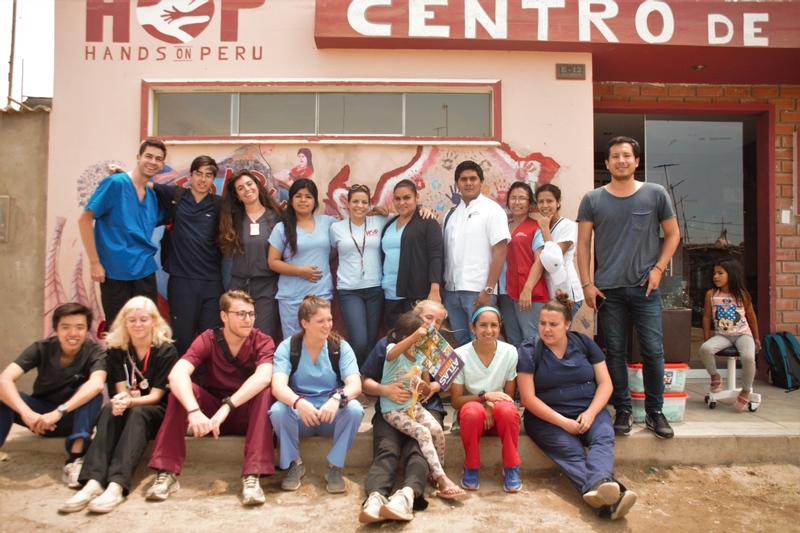 Hands on Peru is a 501(c) 3 nonprofit with an international commitment to improving access to medical care and education for disempowered and marginalized communities in Trujillo, Peru and its surrounding areas. In December 2016 we built our project CESAPU - Centro de Salud Pública, focusing on prevention, promotion, and education of health! We have 5 interactive community programs that focus on sexual and reproductive health education, women's empowerment, Zumba for physical and mental health, recycling and environmental awareness, children's psycho-social development, and disease screenings and doctor's checkups to prevent common diseases! We have created a holistic, integral approach to health and human development in a low-income peri-urban community and have volunteer opportunities for everyone! From volunteers interested in education and child development, to doctors and nurses, and everyone in between! We at HOP Hands on Peru would love to hear from you!